Gary Schacker and David Abel, principals of United Realty/Triangle Properties accepted the "The Association for a Better Long Island Developer of the Year" award on behalf of Quadrangle Properties. Triangle Properties (Tri/Quad) recently received "The Association for a Better Long Island Developer of the Year" Award at the recent ABLI/CIBS Annual Long Island Real Estate Dinner. Tri/Quad has been in business for 40 years and is a regional owner, manager and developer of commercial and industrial properties. 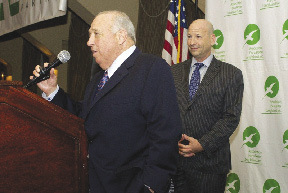 The company and its principals, David Abel and Gary Schacker, were recognized at the event which brought hundreds of Long Island regional real estate industry leaders and professionals together. Tri/Quad was selected by The Association for a Better Long Island (ABLI) as the Developer of the Year in recognition for its thoughtful and effective building design, as well as a unique use of green technologies and materials in the construction of Motor Parkway Plaza. Motor Parkway Plaza is situated on historic Motor Pwy. in Hauppauge and is a multi-use complex. It is one of the first of its kind to receive the prestigious Leadership in Energy and Environmental Design (LEED) Silver Certification on Long Island. The center, featuring advanced, energy-efficient technologies, consists of 33,000 s/f office and retail space, a combination 10,000 s/f office core and 23,000 s/f retail and restaurant space plus a central plaza and parking. A waterfall and sculpture are in the entranceway to the center which attracted many national brand name tenants. ABLI represents billions of dollars in commercial, industrial, retail and residential real estate on Long Island. "Our organization is a strong advocate for progressive energy policies and strategic investment in the region's infrastructure. Our judges were impressed with Motor Parkway Plaza project. The comprehensive 'green building' and design approach will influence the future of commercial property development in the region and beyond. We commend David Abel and Gary Schacker for their vision and execution of this outstanding project," said ABLI president, Jan Burman. "Motor Parkway Plaza took decades of work to bring it to a successful completion. We knew that this was a unique property and we were committed to making it something special in terms of design and how it was constructed. Receiving Silver LEED Certification in 2011 was an achievement that we encourage other developers to strive to attain. Gary and I accept this award on behalf of our team at Triangle Properties and Quadrangle Properties, as well as the many consultants and professionals who made my green building vision a reality,Â” said Abel, SIOR, founder Triangle Properties and Quadrangle Properties.